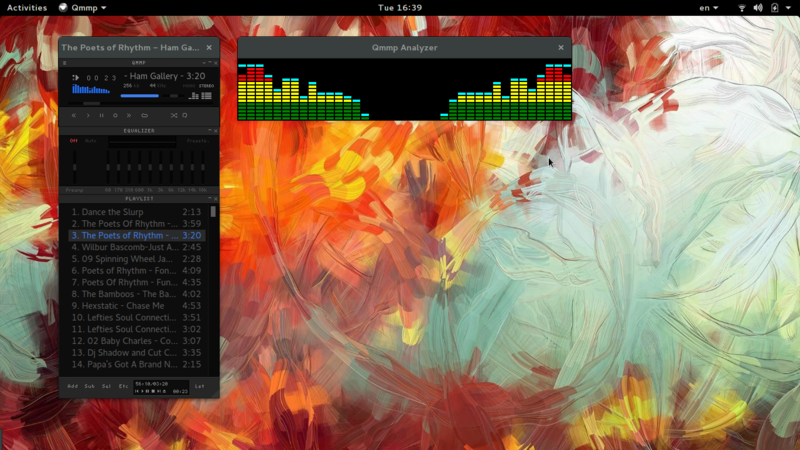 After almost eight years of development, Qmmp has reached version 1.0, so we have a good reason to celebrate with a quick guide on how to get the most out of this winamp-styled audio player for your Linux desktop. 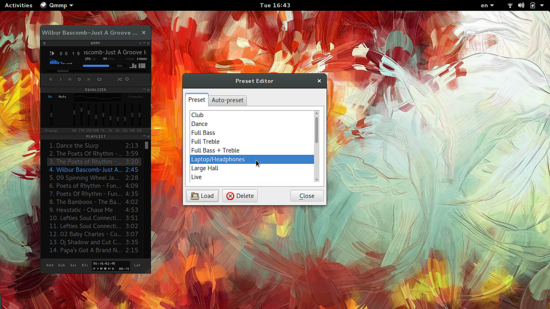 This brand new version brings a lot of goodies, but most importantly it uses the latest Qt v5. The player looks simple and it really is very simple to use, but it actually boasts quite a lot of power under the hood, so here is what we will be exploring on this article. 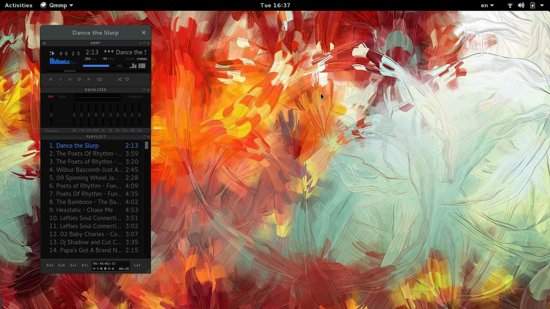 Get Qmmp for your Linux Distribution from here. 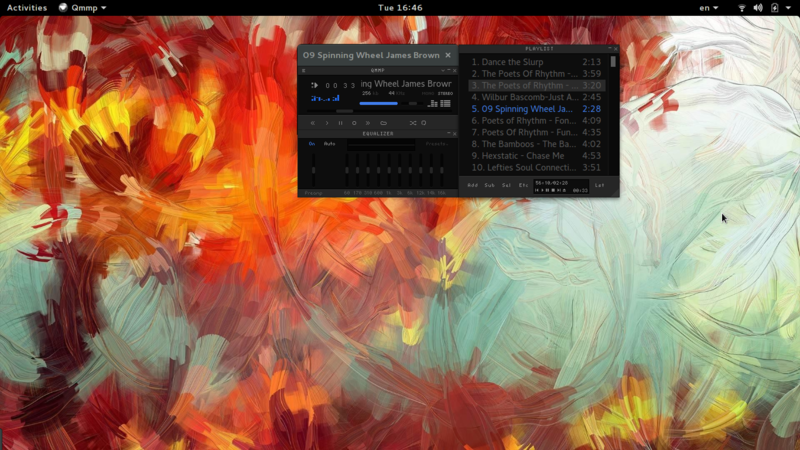 Qmmp looks like the good old Winamp, or Xmms if you prefer, so there's nothing to explain about its design really. The player, equalizer and playlist are three individual and separate windows that can move independently on your desktop, get resized, or even get closed (except for the player window). The new default theme looks cool, and it does even with GNOME's title bars on top of it. There is also a more simple “unskinned” version that comes by default with the app. 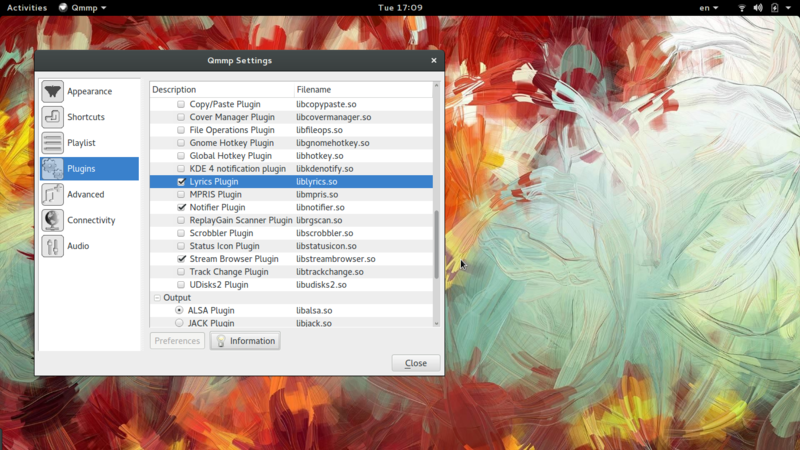 You may set to this theme by pressing “Ctrl+P” and choosing the plugin menu and then locate and enable the corresponding theme at the bottom of the list. Let's start with the classic elements, so here's how to add a configurable equalizer. Press the button on the top left that invokes the options menu and choose Visualization->Analyzer Plugin. You may right click on the visualizer window itself to adjust settings that concern the way it looks and the way it works. To change the theme of the whole player, you can open the Qmmp Settings and choose the Appearance category. There you will find the Skins tab, so hit that “Add” button located on the lower left. 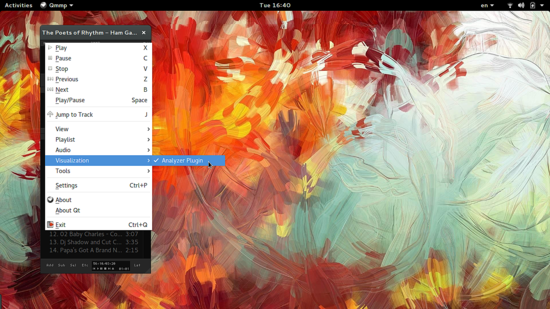 I have downloaded some cool skins for Pardus Linux from sourceforge.net, but you can download more themes from this website. 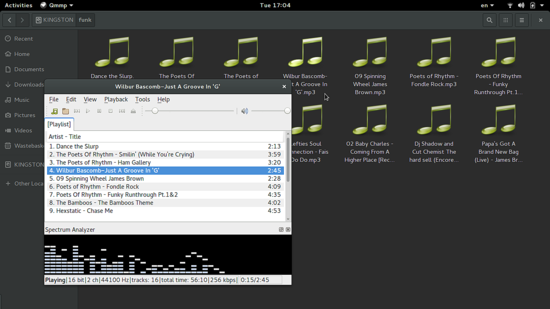 Many Winamp themes work with Qmmp as well, so you can try a lot of different looks for the player if you like. Now let us get to the sound and operation settings of Qmmp. The most obvious sound-related feature is the Equalizer which you can enable from its left side, and then find a suitable preset from the right side. And then there is the crossfading which has been a loved feature of many in the past. 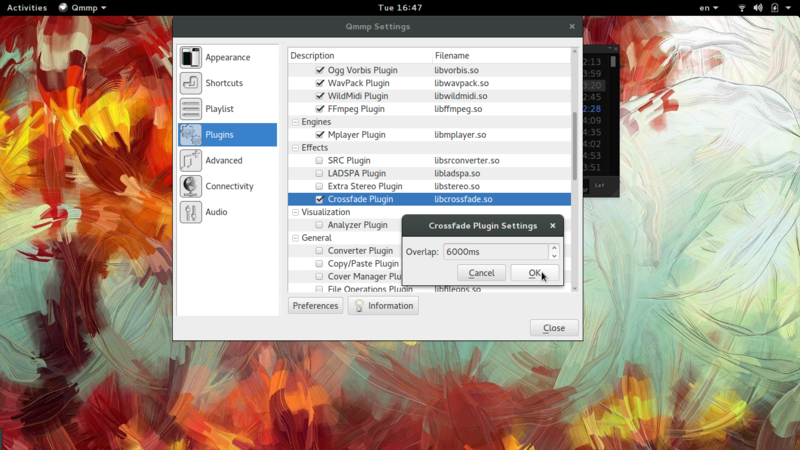 You can enable and set up the Crossfade plugin from Qmmp Settings and the Plugins tab. Do you like receiving notifications? 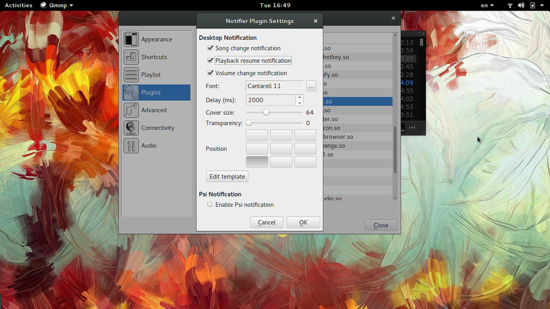 If the answer is yes, then enable the Notifier plugin and choose what notifications you want to be displayed, their size, position, transparency etc. Automated actions are also supported by Qmmp. 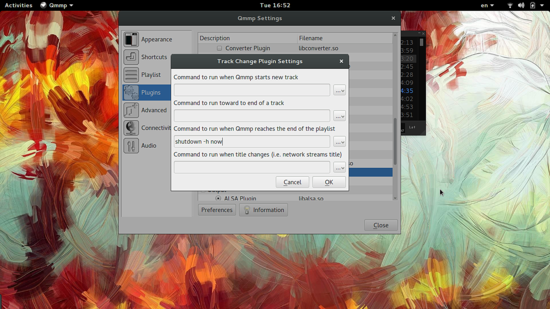 Here's an example according to which the computer shuts down immediately when the music player reaches the end of the playlist. 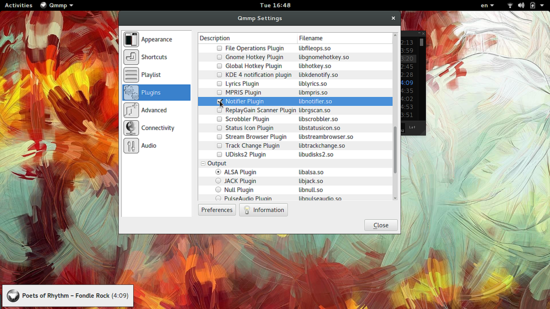 More options like a Lyrics plugin that automatically detects the song and download the corresponding lyrics from the web are available as a plugin. If you like and use the IceCast online service, then enable the Stream Browser plugin. Then go to File->Tools and choose the “Stream Browser”. On the window that will open, hit the “Update” button and then double click on the radio that interests you to add it on the playlist. Then double click the added item on the playlist and wait for the stream to buffer and start playing. If you liked this plugin, you will love this Qmmp YouTube plugin that essentially allows you to search the popular platform for media, and stream and playback them directly from the player.